Rune T. Kidde: Rock'n roll bliver født, del 1: Bo Diddley. Min signerede fotosamling. 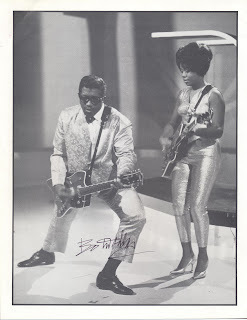 Rock'n roll bliver født, del 1: Bo Diddley. Min signerede fotosamling. Bo Diddley alias Ellas Otha Bates født 30. December, 1928 I McComb, Mississippi og død 2. Juni 2008. Brød igennem i 1955 med nummeret ”Bo Diddley”. Han skabte "Bo Diddley-rytmen", som blev en milepæl i rock and roll-musikken. De ældste eksempler på rhythm and blues-materiale, som er gået over til rock'n'roll'en er Diddleys sange Who Do You Love?, Road Runner, You Don't Love Me og I'm a Man. Derfor var han også kendt som ”The Originator”. Hans kendemærke var en firkantet elektrisk guitar. Diddley har bevæget sig fra Chicago blues, R&B og rock and roll til blues. Spillede guitar, violin, synthesizer, keyboards, klaver, orgel, percussion og trommer. Blev i 1955 udelukket for evigt fra The Ed Sullivan Show, fordi han var bestilt til at spille Tennessee Ernie Ford’s hit "Sixteen Tons", men valgte at spille sit eget nummer ”Bo Diddley” i stedet for, da programmet var gået i luften. 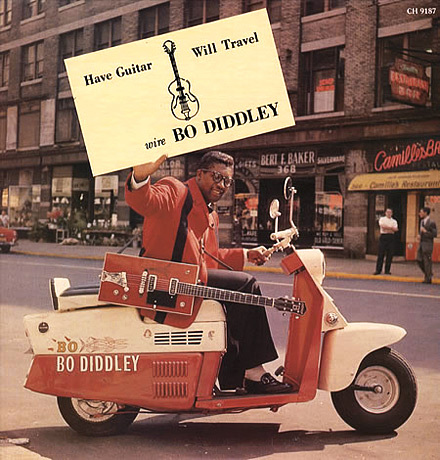 Biografien "Bo Diddley, Living Legend" af George R. White udkom i 1995. Læs mere om Bo Diddley i nekrologen herunder fra. 2. juni, 2008. 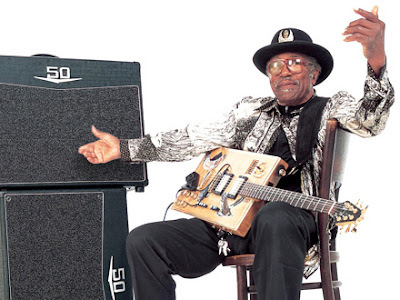 This morning Bo Diddley, passed away of heart failure at his home in Archer, Florida. He was 79-years-old. Bo Diddley is in the Rock and Roll of Hall of Fame, has a star on Hollywood’s Walk of Fame, and received a Lifetime Achievement award from The Grammys. Elvis Presley got a taste of it, Buddy Holly, The Who, The Animals, and The Rolling Stones were all inspired by his music. In an Uncut interview he talked about who belongs in that pioneering rock and roll category.. In that same interview, there is breaking news... He made the first rap record?! : "Say Man, 1959". Asked about inspiring rappers too, Bo Diddley responded..
“Uhuh. But it wasn’t called rap, it was called signifyin’. But the new kids today on the block call it rap and I guess you could say rap is a good name for it since you can’t understand a damn thing they’re sayin’. I think Eminem is the only one you can understand what he’s saying. Will Smith was really good. Sir Mix-A-Lot, you can understand him. But the rest of ‘em, you can’t understand except that it’s dirty, and I don’t like the dirty lyrics. I know for sure that not a single rapper, all the way back to Funky 4+1, grabbed a mic to mimic that record. But it’s all love. Bo Diddley made some great albums and was truly a master. Thanks for the contributions. R.I.P. Tidstypisk version af Bo Diddleys gennembrudshit fra 1965. Navnet? Bo Diddley! Bo Diddleys rap-nummer fra 1959, "Say Man". Bo Diddley live for fuld udblæsning en del år senere med klassikerne "Bo Diddley" og "Im a Man".